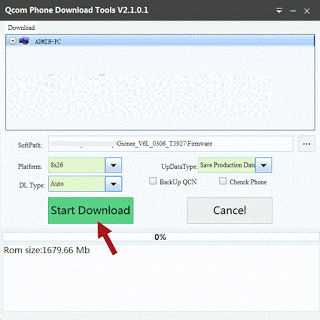 Download QCom Phone Download Tool is a very handy tool that will help you installing a stock ROM firmware on the QualComm Chipset based smartphones, tablets and feature phones. And the QCom Phone Download Tool supports Windows Operating System such as Windows XP, Vista, 7, 8, 8.1 and Windows 10 OS. With this tool, every time you are thinking to either upgrading or downgrading a stock ROM firmware on your QualComm chipset based device manually the procedures will be easy. There are English and Chinese language to choose. You can choose the language you prefer. 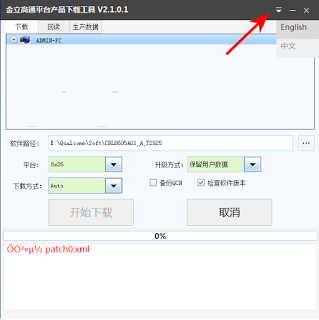 There are number of tabs on this tool however once you have chosen either English or Chinese, then you will not seeing anymore language option to choose in tab. There are also various platforms to choose such as 8X26 and 8974 platform. So choose the platform of your like. This tool also gives you number of downloading types to choose while flashing your preferred stock ROM firmware, the download types provided by this tool are Sahara, FireHouse and Auto. However the default type is Auto and it supports nearly all Qualcomm device models. This feature comes with three options to choose such as Save User Data, Save Production Data and Wipe All Data. If you choose Save User Data then all your personal data such as Photos, Contacts, Apps, Videos will not be deleted. However if you choose Wipe All Data then it will perform a clean stock ROM firmware installations, that means your personal data will be entirely deleted. Step 1 — Download QCom Phone Download Tool then unzip or extract the zip file to your computer. Step 2 — Install the correct Android USB Drivers for your device on your computer. Skip this step if you have done it. 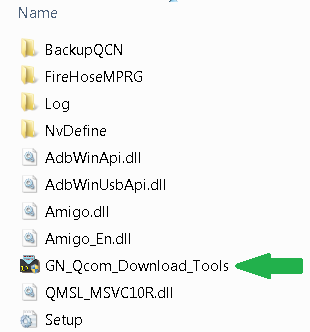 Step 3 — Now open the QCom Phone Download Tool's folder then click this file; GN_Qcom_Download_Tool.exe. Step 4 — Once the QCom Phone Download Tool then Scroll Down Arrow on right top corner just right beside Minimize button. Step 5 — You can choose Save Production Data on the UpDataType tab. Step 6 — On Softpatch tab, you can click the three dots, then find the stock ROM or firmware you previously downloaded on your computer. Step 7 — You can now click the Start Download button. Step 8 — Now turn off your QualComm device and remove its battery if it's removable, if not just turn it off. Then connect it to your Windows OS computer using the USB Data Cable while pressing the Volume Up button. Step 9 — Now you will see the Qcom Phone Download Tool will start the installation stock ROM firmware processes. Step 10 — Just wait the installation processes to finish. Step 11 — If the installation processes done, turn it on your device and put its battery back to its place. Step 12 — The booting process takes place, just wait it may take a while because your QualComm device now loading a stock ROM firmware. For Qualcomm Chipset only. Remember that this tool only supports QualComm Chipset based smartphones, tablets and features. So don't use it for other Chipsets. Alternative Tool. 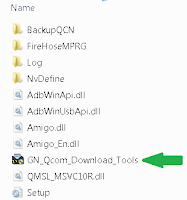 You can also use other tools such as QFIL to install QualComm devices. Windows OS only software. 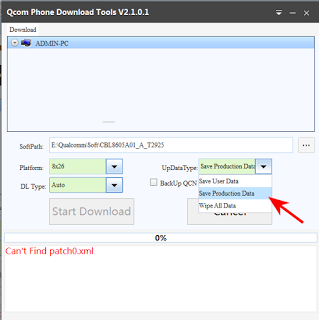 QCom Phone Download Tool can work only on Windows Operating System only such as Windows XP, Windows Vista, Windows 7, Windows 8, Windows 8.1 and Windows 10. Credits. 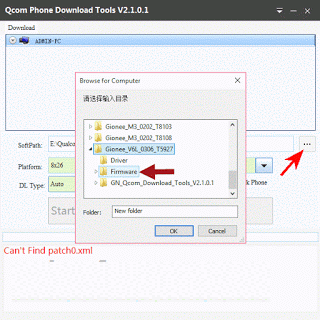 QCom Phone Download Tool is created, optimized, developed and developed by Gionee Qualicom Innovations. Therefore all credits must be given to the company for making this handy tool available for us all to use.